See "arrival at the CiC"
If your flight is delayed or in case of a problem you MUST contact the CiC at the following number: +33 493 473 929 (from a foreign phone). Please keep in mind that once the transfer booking is confirmed and you do not take it without informing us, it will be invoiced 92 euros. The payment of the transfer will be asked upon arrival. Your transfer booking is confirmed only once you have received a written confirmation from us. This is as well valid for the cancellation. * Attention : e-mails are read on working days only (for urgent matters on weekends and holidays, please call our reception desk). by train : Cannes train station (gare SNCF Cannes), take a taxi for about 10 – 12 Euros until the CiC (taxis available right in front of the train station). Or take the public bus (n°20) until the bus stop "Beausite" which is right in front of the CiC. Upon arrival on campus, students receive a "welcome folder"
Students will be subsequently asked to agree in signature to the internal rules of the CiC as well as to pay a 50 € deposit for their room key which will be refunded upon departure when the key is handed back. After paying the balance (if it has not been done yet) the students receive their student card. Then those students living on campus will be accompanied to their rooms and those living off-campus will be picked up at the CiC by their host family or studio-apartment’s owner. 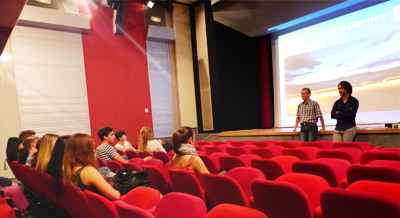 After the regular reception hours, indicated at the "certifiicate of admission", the arriving students will be welcomed by the night receptionist at any time. It is not necessary to buy any books. The books used in class, according to the language level, can be borrowed for a deposit of 20 € which will be reimbursed when the book is handed back. For your own use it is recommended to bring your dictionary and a book with the conjugations of the French verbs (a good one is called "Le Bescherelle"). Students must complete each session according to the conditions under which it began, whether for courses (intensive courses, options) or for housing (on campus in single or double rooms, full-board or half board, off-campus with families or in studio-apartments). For any change for the following sessions the CiC administration requires a notification at least 30 days before the beginning of the session. Health Insurance : Students are advised to take out an individual insurance policy for the duration of their stay The CiC insurance policy covers only against accidents occurring during activities organized by the Collège, but not for injuries incurred in activities it has not sponsored. Civil liability insurance : Students are advised to take out a third-party insurance policy for the duration of their stay. The CiC insurance cannot cover any damages caused by the student to a third person, be it on campus or off campus. It cannot cover neither damages caused to goods belonging to the student, be it caused by the student him/herself or by a third person. If you do not have any insurance of this type for your stay in Cannes, you may purchase the one provided by Guardme. Just click here to find all details about it. The price is 14 € per week and per person. Just tick the corresponding box at our registration form. Students living on campus may deposit their cash, plane tickets, traveller's cheques, etc. in the CiC safe. The CiC cannot be held responsible for theft from rooms. In Cannes, students are advised to be cautious, as in any big international city. Young women are also advised not to walk alone in the streets, at night. Students must respect the internal rules common to all collective bodies. If they are not respected the offending student can be dismissed from the CiC without any refund. Students under 18 years of age must return to the Collège by 12.30am from Sunday to Thursday night and at 2.00 am on Friday and Saturday night. Their parents must also sign an authorization allowing them to participate in the CiC extra-curricular activities and, in case of accident, authorizing medical treatment, hospitalization or any surgical emergency. Important ! The present rules (click here) must obligatory be signed by the parents of the minor student and be returned to the Collège with the registration. The on-site nurse administers routine medical treatment for accidents or minor illness. When a prescription is needed, at the student's request, the nurse calls a doctor who works regularly with the CiC. The doctor's consultation is at the student's expense. Students not belonging to the EU have to apply for a residence permit if they enroll for more than three months. In this case they have to apply to their local French embassy or consulate for a student visa prior to departure. A visa is granted on presentation of the CiC "certificate of admission". Upon arrival the CiC administration will help them to prepare their file for the authorities. For students remaining less than three months, a tourist visa is generally sufficient. 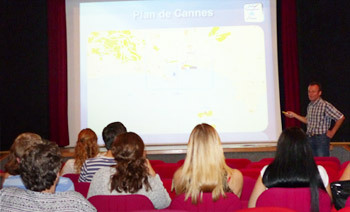 For more information on the "carte de séjour" ,you can check the site of the préfecture des Alpes-Maritimes. is fixed on the last Saturday of the stay. The students living on campus must vacate their rooms by 9:00am, but can leave their luggage at the reception desk and take the brunch as usual. The students living in host family or private studio-apartment must also leave on Saturday morning. A golden rule : "travel light" Your journey will be more pleasant if you do not bring too much luggage. Prior to departure, select your clothes very carefully. Winter : pullovers, sweatshirts, light pullovers, but also a rain coat. The outside temperature may be warm, but you must protect yourself against humidity as in any other seaside town. Spring : sweatshirts, light pullovers. In May do not forget your evening clothes for the film festival. Summer : the temperature can reach 35° C (95° F), so bring shorts and lots of bathtowels. Autumn : weather is like summer until mid-October, then it gets much colder. Plan your clothes for both types of weather.